How to Describe a Pie Chart for IELTS Academic Task 1: Step by step guide. In this IELTS Academic Writing tutorial you’ll learn different ways to describe a Pie Chart for IELTS. We will talk about the best language to use and teach you how to structure your writing to get the best results from your IELTS Academic Writing Exam. Now we will give you a step by step guide on how to structure your Pie Chart description to receive great results on your IELTS Academic Writing Exam. Look for the biggest and smallest sections of your Pie Charts – what do they represent? What is the percentage? Make a quick analysis – note down the times, dates and measurements. See the big picture, avoid getting lost in the details. After all this is a summarizing task. When you are confident you have selected the main features, carry on to Step 2. Write one sentence explaining what the graphs shows. You can paraphrase the title. Pie Chart title: Holiday destinations chosen by Welsh people 1955-2005. Your first sentence: The pie chart shows the vacation preferences of Welsh people over a fifty year period starting in 1955 and finishing in 2005. Talk about the information that you have separated in Step 2. Focus on the first group. Talk about the information that you have separated in Step 2. Focus on the second group. We will begin by giving you some general tips for interpreting a Pie Chart in your IELTS Academic Writing Exam. If you cannot compare the information of your Pie Charts, don’t panic. In such a case giving a summary of each picture is fine. Always pay attention to the time frame of your Pie Charts and use the appropriate tense (past, present or future). Focus on getting all of the appropriate data from the Pie Charts/Graphs into your writing. These are quick tips, if you are still struggling you should consider enrolling in an online course to prepare for IELTS. For pie chart interpretation examples and model essays, click here. 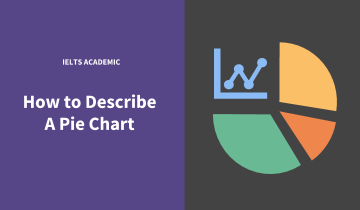 Now that you have the understanding of how to structure your description of Pie Charts and Graphs for IELTS Academic Writing, let’s talk about the language you should use. It is clear that ____represents the largest portion of _____, whereas _____ is undoubtedly the smallest. Sales of _____ stood at __% in 1925, which is the majority of_____. …whereas sales for _____ were just 10%. In 1955 approximately three quarters were ____, whereas in 1960 this had fallen to just under a fifth. 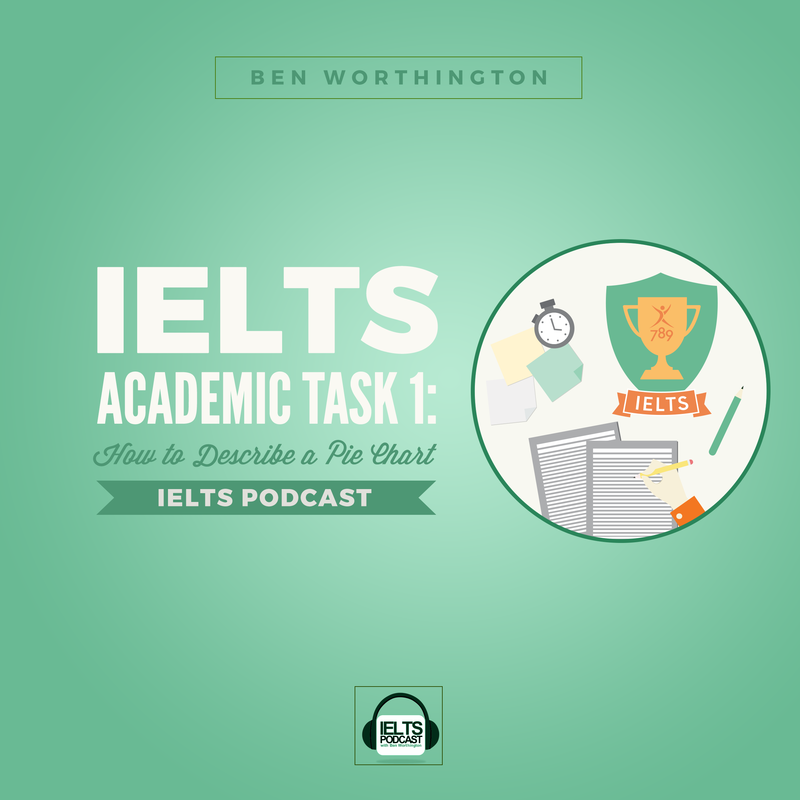 In this tutorial, we’re going to look at how to describe a pie chart for IELTS Academic Task 1. You know me from IELTS Podcast. This tutorial is divided up in 3 parts. First, we’re going to look at the language. Then I want to give you some tips. And then we’re going to look at an easy essay template. Four paragraphs, really simple, and it’s a good way to prepare for the IELTS. and I think it would be really beneficial for you if you did actually write these down as you hear them. Because it’ll help you to remember them. You’ll have them down there on paper as an easy reference. It will improve your listening skills (and of course it will improve your speaking skills because as you write them down, you’ll be hearing the perfect pronunciation… Well, native English pronunciation… Even if I do have a little bit of an accent from the North but it doesn’t really matter. It’s not going to destroy your IELTS speaking exam). So the language for portions. I’m going to give you a variety because you cannot always use the numbers. Because it gets boring and you’ve got to show a range of vocabulary to pick up points for lexical resource. “A small fraction of sales originated in Vietnam.” for example. We can also say, “Exactly 30% or students studied economics.” for example. Hopefully you’ve still got your pen in your hand. I’m going to give you a very useful sentence that you can definitely use when you’re describing a pie chart. All you have to do is identify the largest section and the smallest section. Let me put it in context. One very easy sentence and you can use it in every single pie chart essay. … Well, not “every single.” There may be some cases where you cannot use it but it’s just a general rule. It’s good to have a sentence like that. Copy all of those down. Show the examiner that you have a variety of language. You’ve got a large lexical resource. Now, we’re also going to need the language for comparisons. That’s a useful little phrase there, “whereas,” especially when we’re making the comparisons. Now, if we’re following the four-paragraph model, we’re going to finish with a summary. Just outlining the overall characteristics of the graph/of the pie chart. So another sentence there that you can basically copy and paste and drop into the essay, assuming it is in context. So be careful there; it has to be relevant. You can’t just copy-paste it and just dump it in the essay. So make sure it’s relevant. Now, we’re going to look at some tips. Sometimes, with IELTS Academic Task 1, it’s impossible to compare the information. Maybe you’ve got a table followed by a pie chart, and they just don’t correspond. So in this case, what you do is just write a paragraph about the pie chart, and a paragraph about the table. Now, imagine we’ve got a pie chart showing holiday visits to Germany in 1980, and holiday visits to Germany in 2010. And there’s been a change; there are more visits nowadays. And maybe we want to say it’s because of the popularity of Berlin. Maybe we know because we have a friend in Germany that the change is because Berlin has become very trendy. We do not mention it. We never put our opinion in there. All we have to do is summarize the data. We don’t have to put anything of the reason why, unless it’s actually in the data. But if it’s your opinion and you know why sales have increased, like the prices of oil has increased, or whatever, it doesn’t matter. Don’t put it in there. Just stick to what’s on the paper. Check the time frame on the pie chart. Does the pie chart show you information from 1960? In which case, you’re going to use the past tense. Does it show you information from the current year? Which you’d use the present. Or is it a forecast? In which case of course, you’ll use the future tense. So check the time frame, use the appropriate tense. If you want to pick up more points, extra points, use a passive construction. Grammatical range and accuracy. Show a range of the grammar structures you know. The next one, which is very important. Focus on getting the appropriate data from the graph into your writing. I want to go into more detail about this point in the next slides. 2 seconds. The next points. Now, another tip (which is very valuable) especially if you’re going to write your pie chart using the four-paragraph model that I’ll explain in a few minutes. What you need to do is learn how to paraphrase. It’s not a difficult task. What it consists of is reorganizing the information using a different structure, but still it stays the same. Your first sentence in this essay (if we’re following this four-paragraph model) will just be a very, very simple paraphrase of the title. We’re not complicating things, we’re just going to paraphrase it and we’ve got maybe 10% or 15% of the essay out of the way. And it’s a perfectly acceptable introduction. Learn that people from Vietnam are called Vietnamese. People from England are (obviously) English. From the United States, generally considered American. This is important because it just gives you more flexibility when you’re paraphrasing. Because using the nationality is just saying the same thing, and you can adopt it into different structures. So that just gives you a little bit more flexibility there. Now, those were some tips just regarding your general preparation. Now, if you’re actually in the exam, what I would like you to do is follow what I call a three-step prep. This is an adopted process/adopted model that a friend of mine (Dominic). On his blog Dominic: DCIELTS.com. Go check that out. I’ll put the links in the post. But here, I’ve adopted it from that. And it’s a very practical process you can use for writing your IELTS Academic Task 1 pie chart. First of all, what you do is 3 steps. Look for the biggest and smallest sections. Analyze the time, the dates, and the tenses, and the measurements. Is it in kilos per hour? Is it in square cubic feet? Have a look at that data. Also, when you’re analyzing see the big picture. Don’t go for the details. This is a summarizing task and I want you to just have a look at the overall picture. And in this step 1, you look at it all and then it’s very important that you select and report the main features. Step 2. Organize this information into 2 paragraphs. So following the four-paragraph model, we’ve got the first paragraph is a paraphrase of the title. And then we’ve got 2 body paragraphs. And the first body paragraph, what we’re going to do is we’re going to put the information that we’ve organized in this step. We’re going to group similar ideas together. Paragraph 2 will also be similar. These are your 2 body paragraphs where we put the information that we’ve analyzed in that 2nd step where we’re putting it into the paragraphs and we’re going to write about it. It’s basically deciding what we’re going to write about. Then we write the essay using the template. In this stage when we’re writing it, remember to check for errors once you’ve finished. And follow your essay plan. If ideas pop into your head, ignore them. Just follow your plan. It’ll keep you calm, it’ll keep you on track, it’ll keep you within the time limit. So don’t deviate from that. Now, that’s the three-step plan. Now, we’re going to look at the template which we can use to structure the actual final essay. Paragraph 1 will be one sentence. We’re just going paraphrase the title. Paragraph 2, groups of information from the organization we did in step 2. Paragraph 3, same groups of information collected from the organization in step 2. Paragraph 4 will be one or two summary sentences showing the major overall trends from the graph. In this stage, we’ll use the summary sentences that I talked about at the very beginning. Paragraph 1 is the paraphrase of the title. Paragraph 2 and paragraph 3, we’re going to just put the groups of information that we’ve organized previously. And paragraph 4, 2 summary sentences. The major overall trends. So like I said before, the guide was adopted from Dominic Cole’s site: dcielts.com. Have a look there. Lots of detailed resources. And also, if you haven’t already, I strongly recommend that you go to ieltspodcast.com. Sign up there, leave your email, and you’ll get lots and lots of valuable resources. And it’s just pure content. Pure step-by-step tutorials that I sent every week to subscribers. So yeah, that’s one of the best things you can do to guarantee your IELTS success. If you’re having any problems, send me an email. I’ve helped lots of students. I enjoy helping them. So if you’re going through a tough time, just keep on working. Keep doing it, and eventually you will get there. I’ve been in similar situations. You just got to persevere. Remember to sign up and send me an email. Tell me how it’s going. Graphic Detail – Great resource from the Economist.com -perfect for chart descriptions and graphic explanations of current events. Sample Academic Task 1 Diagrams – from bar charts to pie charts, lots of sample diagrams. Learn how to describe a bar chart for IELTS, full tutorial here. High quality IELTS essay correction for feedback and improvement, here. Check the graph title, and the pie chart subtitles, look for dates! Check you don’t accidentally switch the tense half way through. Sometimes you will get charts and graphs that will require you to use more than one tense, but do this deliberately and with caution. For a more in depth tutorial about tenses check out this page: 126 IELTS Academic Task 1 – What tense? !